A truly epic passage infused with folk and choruses. Ensiferum began its journey around 1995 but it was not until 2001 where they release their highly acclaimed self-titled debut album “Ensiferum” under Spinefarm Records, Markus Toivonen and Jari Mäenpää formed a fairly efficient couple, Mäenpää remained in the band until the release of their second full length album, "Iron" in 2004 leaving Ensiferum to continue with his own project (Wintersun), Miettinen bassist and drummer Fokin they departed from the band also, but this would not be the end for Ensiferum and creator Markus, he brought to Parviainen to filled up the drums, Lindroos on guitars and vocals (harsh), Hinkka on bass, and Enho for keyboards, this line-up recorded the EP "Dragonheads" in 2006 and the full length "Victory Songs" in 2007, keyboardist Enho decided to leave the band and its replacement is found in the person of Silvennoinen she is who has been playing with the band since then, with this group they have released 3 full length so far "From Afar" in 2009, "Unsung Heroes" in 2012 and their latest production "One Man Army". 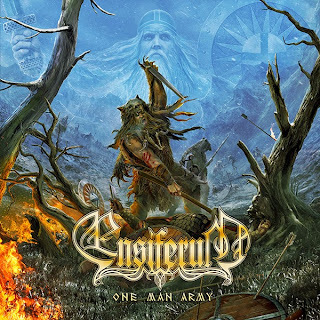 Old fans tend to harshly criticize the direction taken by Ensiferum, but I could bet that if Ensiferum have remained true to what the old fans call their original sound, right now they would be harshly criticizing the monotony and lack of direction "One Man Army" is a solid album, a production maybe slightly clean but with good compositions, this album could be defined as a mixture of elements found in the two previous albums "From Afar" and "Unsung Heroes" definitely a genuine piece worthy to appear in the top ten within the genre.